Smoked tofu jerky is a delicious smoky snack, which I made for the first time entirely by accident! 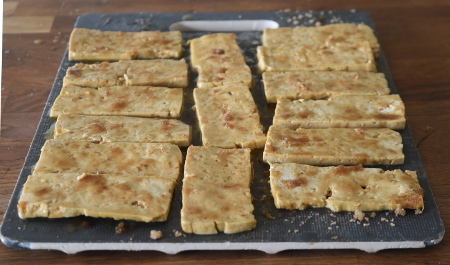 After experimenting with different marinades and wood chips to create the perfect smoked tofu, I made a yummy tofu slice that resembled the beef jerky that I used to eat as a teenager. 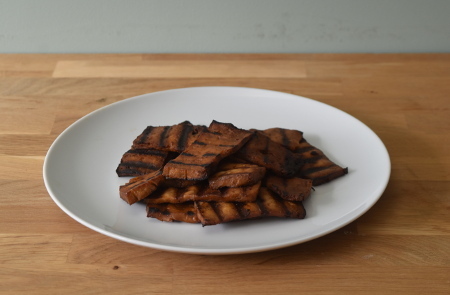 With the intense smoke of hickory and a sweet soy marinade, this smoked tofu jerky is powerfully tasty. 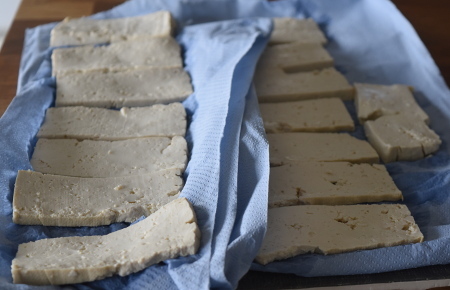 Making a tofu jerky requires a little patience, as smoking low and slow is the key to success, alongside allowing the time for tofu pressing and marinating. However, it is best served cold, so it’s great to make in advance for any barbecue party. Smoking anything requires heat deflector stones and a barbecue with a lid, as the direct heat will burn the food that you’re smoking – remember: low and slow is key! This recipe also necessitates a 2nd tier grill and plancha, because the tofu would otherwise stick to the grill. Makes about 15 pieces. Prep time: 1 hour, cooking time: 2 hours. Allergens: soy (tofu, soy sauce), gluten (soy sauce – use tamari to make it gluten free), mustard (Dijon mustard), sesame (sesame oil). Slice the tofu into thin pieces – I got 15 slices out of one block. Then press the tofu; I do this by laying out the slices on paper towel, covering them with another few layers of paper towel and placing a weight on top of them to squeeze out the water. Leave to press for at least 15 minutes, replacing the paper towel if it soaks through. While waiting for the tofu to press, whisk together the soy sauce, maple syrup, lime juice, vegetable oil, Dijon mustard, sesame oil and 2 tbsp brown sugar. Gently place the tofu slices in the marinade and leave for at least 15 minutes, preferably half an hour. Because the slices are so thin, they will take up the marinade significantly quicker than if you were using a whole block in one piece or thicker slices. Light your barbecue and heat it to the low temperature of 120°C (248°F) – once nearing the target temperature, put in your heat deflector stones, grills and plancha, with the griddle side up. Put a little bit of the marinade on the plancha – as it contains oil, it will help stop the tofu from sticking to the plancha. Just before you’re ready to cook, take the tofu slices out of the marinade and pat them dry to get rid of excess moisture. Dip each slice in agave syrup, covering both sides. Then sprinkle 5-7 tbsp of brown sugar over a dry board and rub the tofu slices in it, both sides. 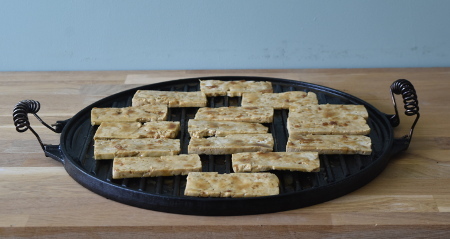 Place the tofu slices onto the plancha and close the lid of the barbecue. Using a smoke chip feeder system or otherwise, pour a good handful of hickory chips onto the hot barbecue coals. Turn the tofu slices every half an hour, and pour another handful of hickory chips onto the hot charcoal straight after. Keep them smoking at that low temperature for two hours, making sure that the temperature stays low - you will have to almost completely cut off the air flow to the barbecue. Take out your smoked tofu jerky slices and leave to cool. When cold, they should have a lovely, chewy texture and a rich, smoky flavour. Try dipping them in my Banging Barbecue Sauce! Enjoy!